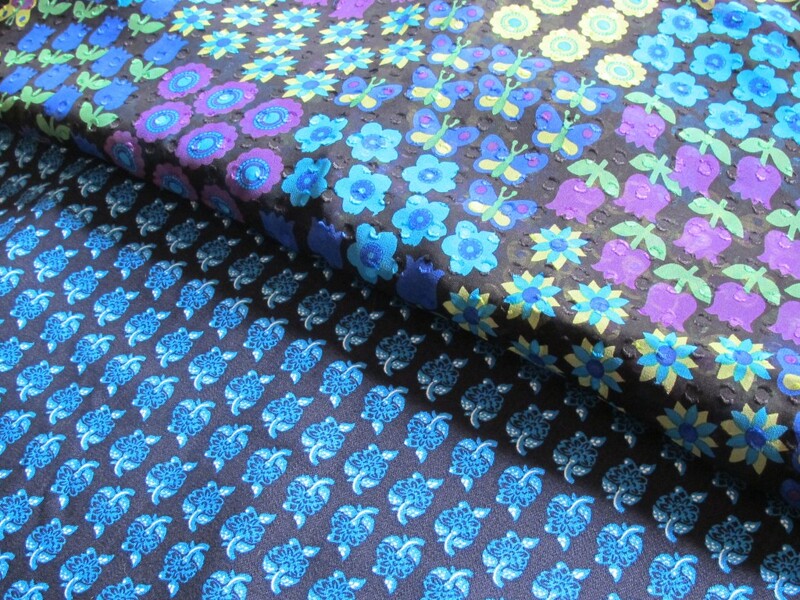 This fabric is a medium weight cotton. It is like a denim but not as heavy. It has some mechanical stretch, just a touch. Usually with cottons the stretch is elastin. The print and colours in this fabric are lovely. 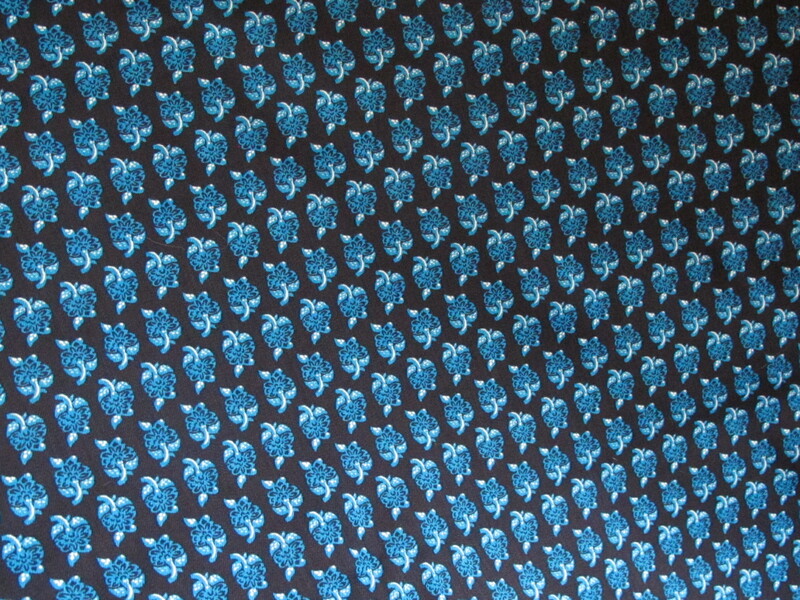 A pattern of small fleur-de-lys all in a row repeats row after row throughout this fabric. But the pattern is much softer than a stripe, there would be no trouble at all pattern matching. 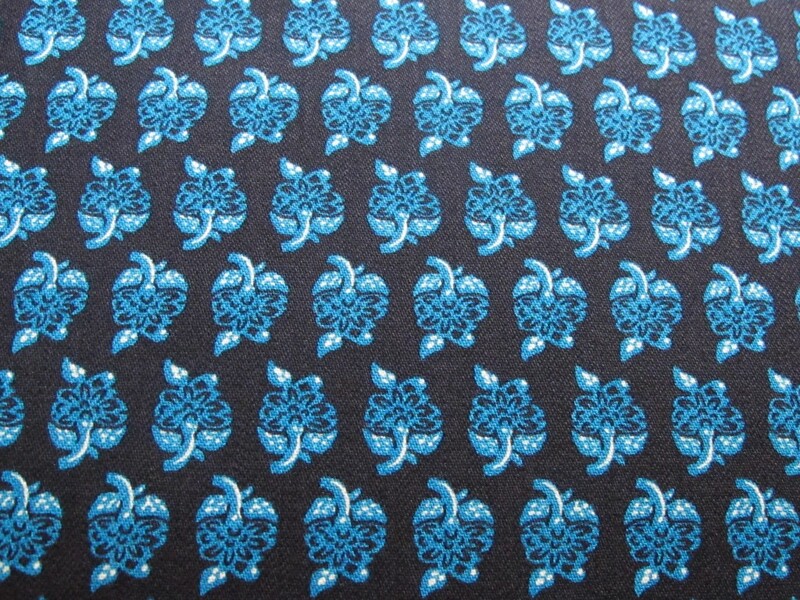 The colours are a deep dark blue/indigo background, the fleur-de-lys are an aqua blue with white and black touches. 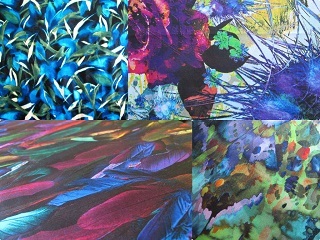 Very versatile colours. With the small scale pattern and classic blue patterning you can create really versatile garments. Perfect to wear with crisp white shirts and tops, or a solid fabric in just about any other colour. I’m not going to have a chance to post this contrast fabric tonight, but if you like doing print and print matches, this Anna Sui silk goes just fabulously with the T0ry cotton. I’ll post the Sui silk within a day or so. 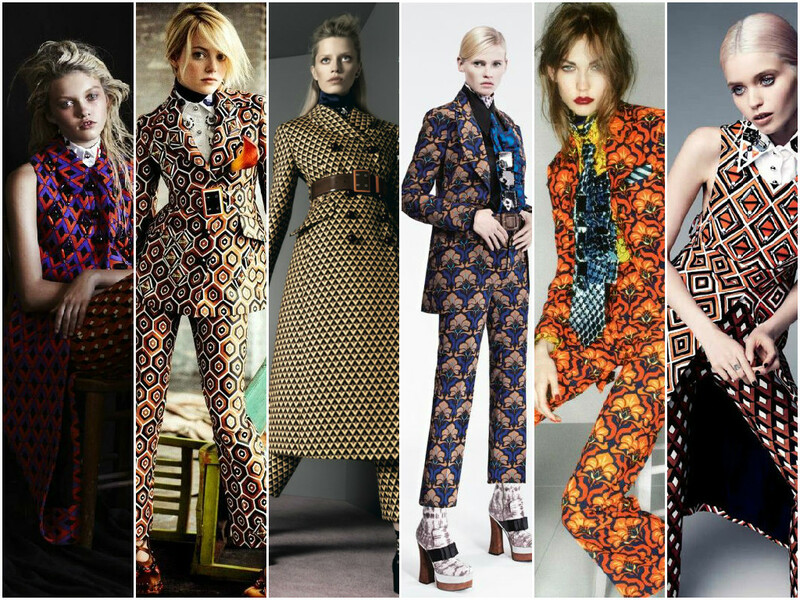 I had in mind these Prada and Miu Miu suits when I bought this fabric. And now look at the new season’s clothes! 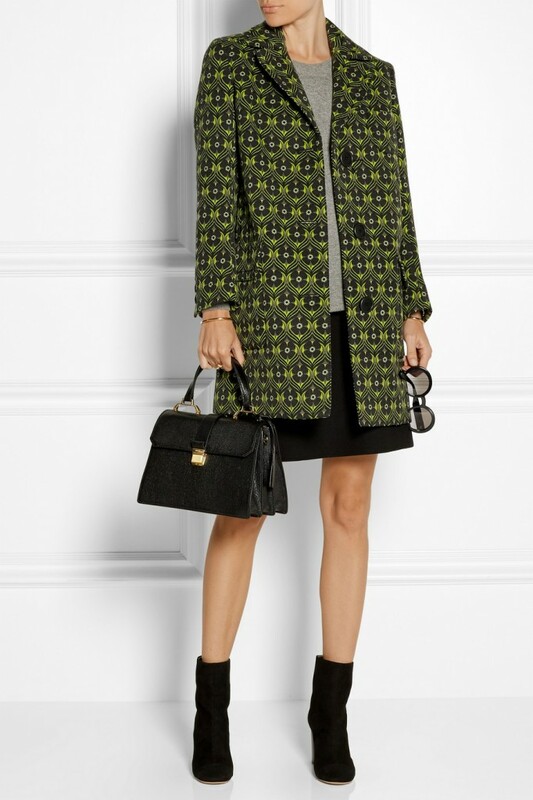 This fabric is made for some of the latest things…this Miu Miu coat and the Giambattista Valli trousers! Ok, so there’s quite a bit of this fabric. The width is 140cm and the length is 3.8 metres. That might be too much for one, unless you wanted to make a suit or some separates. So I would be happy to offer this fabric as two lengths of 1.9 metres each, provided the full length is accounted for before I cut. 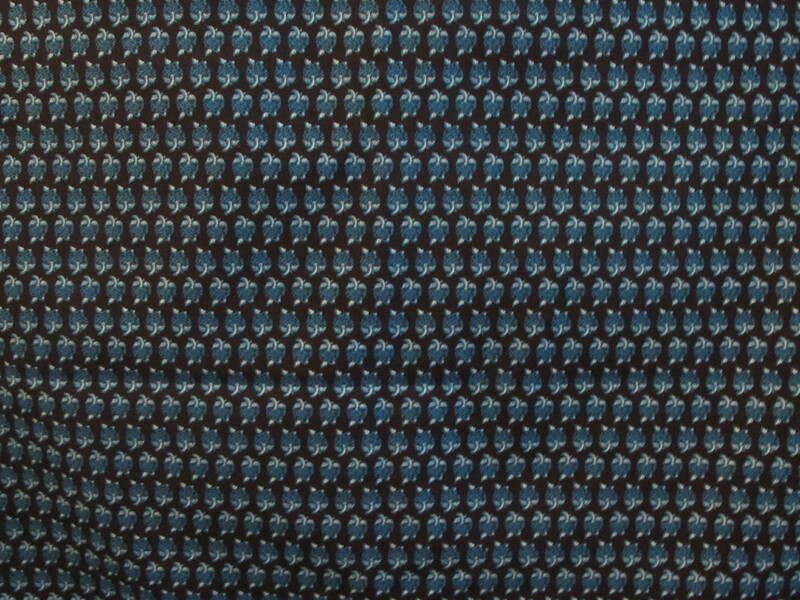 I paid over $30 a metre for this fabric but will offer it here discounted at $22 a metre. For the full length the fabric would be $88. Or the half length would be $44. The post cost would depend on the yardage. My photo skills (such as they are) seemed to desert me with this fabric. I’m putting this next shot up because it shows you the scale of the pattern, but it is a very un-great shot, sorry.